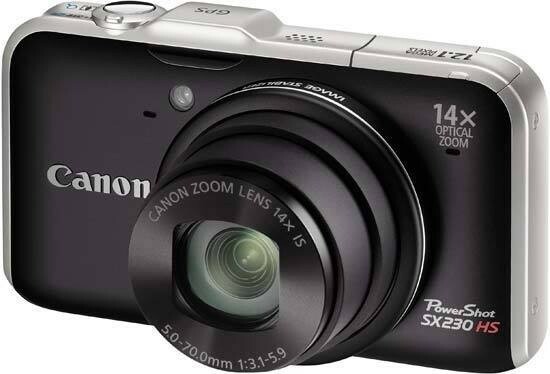 The Canon PowerShot SX230 HS camera is a new travel-zoom camera that replaces the SX210 model. There's a 14x, 28-392mm optical zoom lens with built-in image stabilizer, 12.1 megapixel back-illuminated CMOS sensor, 3 inch LCD screen with 460k-dot resolution, DIGIC 4 image processing engine, full 1080p HD Movie Mode with stereo sound and an HDMI output, and Smart Auto mode with Scene Detection Technology and an Easy mode for beginners. The Canon SX230 HS also offers built-in GPS (the only difference between the SX230 and SX220 models), a full range of manual exposure modes for more experienced photographers looking to take control, 8.1 fps burst shooting at 3 megapixel resolution, and a Super Slow Motion Movie mode. The Canon PowerShot SX230 is priced at £299 / $349.99 and is available in pink, blue or black. At first glance the SX230 HS looks to be from exactly the same mould as its SX210 IS predecessor, but design-wise and operationally it's not an exact match. The build quality is the usual marriage of plastic and metal, with the PowerShot SX230 HS feeling sturdy enough when gripped in the palm to withstand the odd drop or knock in its inactive state. Curved edges make it appear less boxy and rectangular than it actually is. Whilst the camera is bigger than your average compact, it still just about fits into your pocket and is reasonably light too at 223g even with the memory card and battery inserted. Plus the modest additional bulk feels a fair compromise for that built-in zoom power, the lens extending an ungainly 2-inches from the body when at maximum 392mm equivalent telephoto setting. The small raised lump on top of the camera next to the shutter release houses the GPS system, the only main difference between the SX230 HS and the cheaper SX220 HS model. The GPS is set to off as a default and to enable it, you have to go into the main menu, go to settings and scroll down to the GPS sub menu. It's worth noting that GPS can't be used in every country and if you're travelling abroad, you should check with that country's regulations to make sure you're ok doing it. Changing modes and features such as the GPS is a simple task thanks to a friendly user interface (UI) and easy to use menu system. Of the two menus, arguably the one you will use the most is the function menu. After all, it gives you access to the most used functions of the camera. Everything is labelled clearly so you can understand what is what and the same goes for the main menu. The GPS system does have trouble indoors or under cover. We found it worked perfectly outside even with cloud cover. Software for uploading the pictures to Google Maps is included along with the manual disc in the box. You can easy install all items or custom install just the ones you want to. It's relatively easy to find out how to view your pictures on the map, the main problem we had was how to navigate away from the My Pictures folder that the software defaults to, so that we could get to our dedicated folder storing the Canon pictures. The ones that have GPS information will have a small satellite icon in the top corner. The readings are extremely accurate – we would say to within a few metres - although one picture said we were at the house next door. This shooting mode dial is also where you'll find the camera's scene modes, some of which again mirror the kind of selections you'll find on the latest consumer DSLRs and Micro Four Thirds hybrids. As with the latest additions to the Olympus Pen series, here we get access to a diorama effect (which Canon has simplified on the function menu as 'miniature effect'), fast becoming this year's must have on-board feature, plus a perspective warping fisheye option. Further hand holding is provided by the Smart Shutter mode that as it sounds allows the shutter to be controlled with a smile or a wink - increasing the overall user-friendly feel and handy for when you want to include yourself in the picture. Of course when you're given fun new tools such as the above effects, the overwhelming temptation is to go crazy with them. Certainly the tilt and shift lens-like 'miniature effect' that transforms friends and colleagues into the equivalent of toy soldiers is hard to resist. Plus, with a press of the 'display' button on the Canon's back plate followed by a toggle of the zoom switch on the top plate, users can go one further and precisely control the width of the portion of the image that is sharply in focus, leaving the rest artistically blurred. Unfortunately such effects cannot also be used when recording movies - though users do have access to the 'My Colors' settings, including colour swap and colour accent for anyone wanting to experiment something visually different from the norm - even if the results do at times resemble an early 1990's grunge rock video. Smart Auto is deployed in movie mode, though, the camera referencing 18 different presets to find the most appropriate. Perhaps most usefully, the full extent of the 12x optical zoom can also be deployed when shooting movies, its ultra quiet transition meaning that the built-in microphone doesn't pick up operational buzzes - the usual reason for manufacturers disabling the zoom. Focus is automatically adjusted as the user zooms in or out, which, with no alternative manual adjustment ring, means the image can go soft for a moment or two before the camera locks on target. Canon states that Dynamic Image Stabilisation also kicks in when shooting video to ensure smooth tracking shots, of use when filming whilst walking for example. The SX230 HS records 1920x1080p Full HD movies at 24fps with stereo sound, making it one of the few compact cameras currently on the market to offer such good quality. Ensuring swiftness of operation, Canon has included a Digic IV processor as found within its more grown up DSLRs. Otherwise the PowerShot SX230 HS incorporates technology very similar to its other current non-super zoom IXUS and PowerShot compacts. As previously touched on, it features Smart Auto with Scene Detection Technology whereby the camera compares subjects with 22 on-board variables and selects the most appropriate for optimum results. Also making an appearance here are shadow detail enhancing i-Contrast, Smart Flash Exposure which adjusts flash levels according to prevailing conditions, plus Face Detection technology which can recognize up to a whopping 35 faces in a frame, whilst Face Self Timer allows you as photographer to join them before the shutter fires. The SX230 HS sports a built-in flash of the pop up variety. Good, as this lessens the chance of red eye (with automatic red eye correction software further built-in as a belt and braces approach and selectable via the shooting menu folder). However, unlike competing models that present said flash when requested, the Canon's flash automatically pops up when the camera is initially switched on, whether you like it or not. This is inevitably slightly irritating if you don't actually intend to use it. Pressing it down and returning it to its dormant state naturally deactivates it, but at times it feels more like you're fighting with the camera than engaging seamlessly with it. As expected, in the absence of any modest integral memory - something with which Canon has quietly stopped bothering with of late as resolutions have grown higher - captured pictures and movie clips are written to optional SD, SDHC or even higher capacity (up to 2TB) SDXC cards. As regards video, the ability is also provided for Eye-Fi transfer and the camcorder-like direct upload of videos to YouTube to keep the younger members of the family happy. Though it offers a very extensive lens reach for a compact, the front of the SX230 HS is clean and unthreatening. We're provided with a smattering of style despite its plastic-y build by virtue of the different coloured top plate strip that continues down both sides of the camera and thus 'frames' the faceplate like the mantle of a fireplace. Though the slightly off-centre lens positioning inevitably dominates - the full physical extent of it hidden when the camera is in its dormant state - Canon has positioned a small window for a self timer/AF assist lamp to its top left. Top right of the lens, we find a tiny catch for manually activating the pop up flash via a fingernail if required. There are also two small holes either side of the lens for the stereo sound microphones. The top plate strip is slightly more interesting. Looking at the SX230 HS from the rear we find the flash positioned over to the far left and neatly flush with the body when not in use and a built in speaker for playing back sound with clips. Over to the far right where it naturally falls under the forefinger of the right hand is the shutter release button. Apart from the rear plate shooting mode dial and scroll wheel it's the largest control here and has just the right amount of 'give' to enable users to determine a definite halfway point when pressed. Now encircling the shutter release button is a responsive rocker switch for operating the zoom - a nudge to the right zooming in, to the left zooming out. The on/off button has been moved to the rear of the SX230 HS. Press this and the camera powers up in just over a second, rear LCD bursting into life, zoom extending to maximum wideangle setting and flash popping up nigh simultaneously so the camera is ready for action. With a half press of the shutter release button the camera takes a further second to determine focus and exposure, AF point/s highlighted in green with the customary beep of confirmation that focus and exposure has been determined and the user is free to pursue the shot. Go on to fire the shutter and a full resolution 12 megapixel image is committed to memory in a couple of seconds, the screen briefly blanking out before returning to the real-time scene before the lens. The amount of time the captured image appears on screen as a means of review can be altered via the menu folders. The SX230 HS features an excellent 3-inch, 460k dot resolution widescreen format LCD at the rear that displays a 4:3 image ratio as its default setting. That's unless one is shooting HD movies with stereo sound, whereby the picture is automatically relayed in 16:9 ratio to more closely ape how it would appear when viewed on a desktop PC, or a flat panel telly. The High-speed Burst mode shoots at up to 8.1 shots/sec. albeit only at 3.0 megapixel resolution, while the Super Slow Motion Movie mode offers a great way to dramatically slow down fast-moving subjects, shooting at either 240 fps at 320x240 resolution or 120 fps at 640x480 pixels. With approximately four fifths of the Canon's backplate taken up with the elongated widescreen format LCD, its operational controls are shunted over to the far right. Starting at the top, we have the circular on/off button and a penny-sized shooting mode wheel with ridged edge enabling a more definite purchase and nicely solid feel. This rigidity ensures it clicks into place for each setting in such a way that it is hard to accidentally slip from one option to another when fetching the camera out of a pocket or camera bag. The 13 strong options here comprise Smart Auto and Easy Auto modes as discussed, plus the creative quartet of Program, Aperture Priority, Shutter Priority and Manual shooting settings. For the point and shoot brigade the SX230 HS has further easy access pre-optimised modes for portraits and landscapes, along with a kids and pets mode. All of the other scene modes setting are grouped together under the Scene option, and there's also a new Effects mode and last on the dial the movie shooting option. That said, users don't have to actually be in movie mode to commence filming - a press of the dedicated recording button lets video capture commence as a handy short cut. A new addition to the shooting mode dial is the Movie Digest option. This captures up to 4-seconds of the action before a shot is taken, then joining all the clips together from the same day into a single VGA movie, which creates a time-lapse movie overview. Going back to Effects mode for a second, this is where you find the Canon's nifty effects settings. To access these, first set the mode dial and then press the 'function/set' button in the middle of the scroll wheel/command dial near the camera's base. A familiar (to Canon users at least) toolbar of options is then presented at the left hand side of the LCD. The first option you come to is record mode, and this is where the Fisheye, Miniature, Toy Camera, Monochrome, Super Vivid, Poster, Colour accent and Colour swap effects 'live'. A live preview of each one is handily shown on screen so you don't even have to take a picture to see what the results of each effect will be. In the Scene mode, users are presented with the Smart Shutter mode which as it sounds allows the shutter to be controlled with a smile or a wink - increasing the overall user-friendly feel and handy for when you want to include yourself in the picture. There's also the High-speed Burst mode, Best Image Selection, Handheld NightScene, Low Light, Beach, Underwater, Foliage, Snow, Fireworks and Stitch Assist Panorama options. By moving up or down the same toolbar the likes of white balance can be manually adjusted, the Canon proprietary 'My Colors' effects turned on or off, and quality settings further adjusted for shooting both stills and video. Below the shooting mode dial are the aforementioned one-touch video record button, and next to it the identically sized replay/playback button. These two self-explanatory controls sit above the command/dial scroll wheel, which, unusually, is free from external markings. Yet give it a press and a virtual dial appears on screen with the formerly hidden settings now revealed. It's here alterations can be made to flash settings, as well as those for self timer, auto, close up (to 5cm from a subject) or manual focus, plus exposure compensation (+/- 2EV). In manual focus mode a distance slider appears at the right of the screen, adjustable with a swivel of the scroll wheel (so it's a bit fiddly), rather than more intuitively tabbing up or down. Any changes to the status quo are naturally effected with a press of the central function/set button as previously described. We'd have liked Canon to have found room for a dedicated delete button here or somewhere else on the camera back. As it is, no less than six button presses are required before a duff shot can be deleted. Such tediousness seems to go against the ease of use ethos deployed elsewhere in the camera's operational arsenal. The bottom pairing of buttons on the SX230 HS' back meanwhile are for the self explanatory 'display' and 'menu'; press the former and on-screen shooting information is either turned off or summoned up. Via the menu screens, users can also activate compositional grid lines or opt to present an image with grey bars cropping the default 4:3 presented ratio to a 3:2 ratio equivalent if so desired. Subsequently a press of the 'menu' button itself brings up two folders - the first containing the shooting menu - it's here users can activate the likes of the iContrast setting - the second the standard set up menu. The right hand flank of the camera - if continuing to view it from the back - is where you'll find HDMI connectivity under a plastic port cover attached via a rather flimsy rubber catch. This is the port allowing the camera to be hooked up to a flat panel TV once you've purchased the relevant cable, and is presented adjacent to a second more traditional AV/USB out port. Under this compartment there's a plastic lug for attaching the wrist strap provided in the box. Underneath a side open catch and door at the base of the SX230 HS there's another dual compartment - with a slot for media card plus the provided rechargeable battery, good for a so-so 210 shots from a full charge, 50 less than its predecessor. Though it does have a couple of operational quirks - the flash popping up automatically on power up whether you'd previously deactivated it or not, plus the multiple button presses needed to actually delete something - we found the SX230 HS' good points outweighed the bad and that it is, all things considered, fun to use. Of course, build and handling aside, image quality is ultimately what counts, so we're interested to see how the Canon performs on that count.